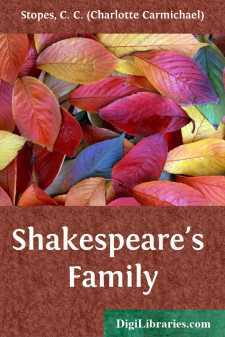 When I was invited to reprint in book-form the articles which had appeared in the Genealogical Magazine under the titles of "Shakespeare's Family" and the "Warwickshire Ardens," I carefully corrected them, and expanded them where expansion could be made interesting. Thus to the bald entries of Shakespeare's birth and burial I added a short life. Perhaps never before has anyone attempted to write a life of the poet with so little allusion to his plays and poems. My reason is clear; it is only the genealogical details of certain Warwickshire families of which I now treat, and it is only as an interesting Warwickshire gentleman that the poet is here included. Much of the chaotic nonsense that has of late years been written to disparage his character and contest his claims to our reverence and respect are based on the assumption that he was a man of low origin and of mean occupation. I deny any relevance to arguments based on such an assumption, for genius is restricted to no class, and we have a Burns as well as a Chaucer, a Keats as well as a Gower, yet I am glad that the result of my studies tends to prove that it is but an unfounded assumption. By the Spear-side his family was at least respectable, and by the Spindle-side his pedigree can be traced straight back to Guy of Warwick and the good King Alfred. There is something in fallen fortune that lends a subtler romance to the consciousness of a noble ancestry, and we may be sure this played no small part in the making of the poet. All that bear his name gain a certain interest through him, and therefore I have collected every notice I can find of the Shakespeares, though we are all aware none can be his descendants, and that the family of his sister can alone now enter into the poet's pedigree with any degree of certainty. The time for romancing has gone by, and nothing more can be done concerning the poet's life except through careful study and through patient research. All students must regret that their labours have such comparatively meagre results. Though sharing in this regret, I have been able, besides adding minor details, to find at last a definite link of association between the Park Hall and the Wilmcote Ardens; and I have located a John Shakespeare in St. Clement's Danes, Strand, London, who is probably the poet's cousin. I have also somewhat cleared the ground by checking errors, such as those made by Halliwell-Phillipps, concerning John Shakespeare, of Ingon, and Gilbert Shakespeare, Haberdasher, of London (see page 226). I hope that every contribution to our store of real knowledge may bring forward new suggestions and additional facts.